Why did you start polka dot teapot? I started Polka Dot Teapot because when I originally came out of university, the only fashion jobs available were ones that required at least 2 years experience and the only way to get this experience was to work as an unpaid intern. So I decided I would create my own business doing what I love, and gaining experience at the same time. Do you hand make your items? 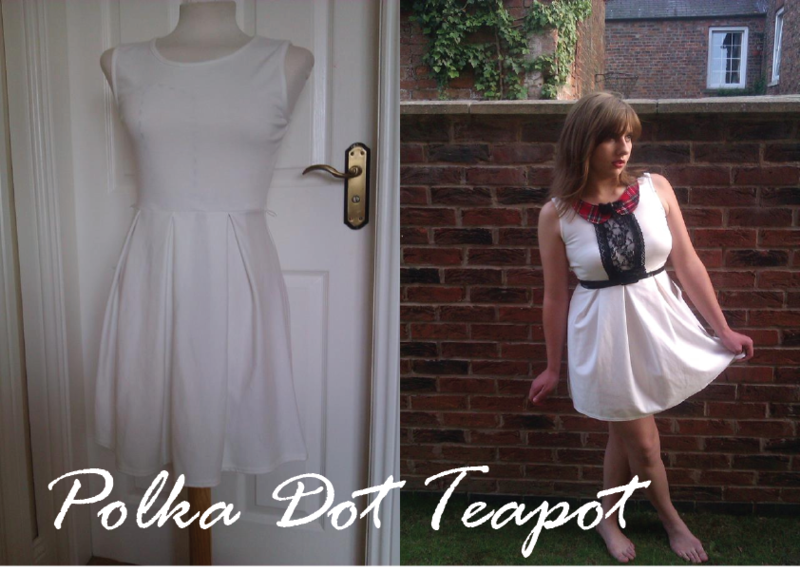 Yes all of my items are handmade, other than the customised skater dresses, which are bought in, then hand customised. What your favourite item you are currently selling? My favourite items at the moment are my customised skater dresses, as they are so much fun to make, and I love creating designs to suit peoples styles and shapes etc. I also love the classic message in a bottle necklaces, I make. Do your pieces from your shop reflect this? I don't really have a particular style, someday's I like to wear vintage style tea dresses, and sometime's I'll wear leggings a shirt and biker boots. I'd say my pieces generally reflect the quirky vintage side of my style. What inspires you when picking/designing your products? Anything and everything, pintrest is a big inspiration for me, I love seeing what peoples boards on there. Also I read a lot of fashion and beauty blogs. I'd love for you to check out laura's links!